Did the Army Use Psy-Ops on Members of Congress? The orders came from the command of Lt. Gen. William Caldwell, a three-star general in charge of training Afghan troops — the linchpin of U.S. strategy in the war. 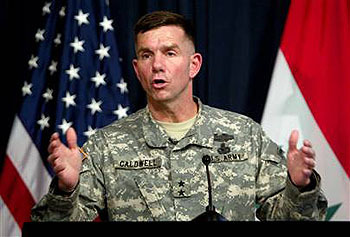 Over a four-month period last year, a military cell devoted to what is known as “information operations” at Camp Eggers in Kabul was repeatedly pressured to target visiting senators and other VIPs who met with Caldwell. When the unit resisted the order, arguing that it violated U.S. laws prohibiting the use of propaganda against American citizens, it was subjected to a campaign of retaliation. It’s worth noting that this story is essentially single-sourced to Holmes, who was later investigated and reprimanded for “going off base in civilian clothes without permission, improperly using his position to start a private business, consuming alcohol, using Facebook too much, and having an ‘inappropriate’ relationship with one of his subordinates.” Holmes says the reprimand was retaliation for refusing to break rules, but there’s no independent verification of that. There’s always the mirror-image possibility that Caldwell did nothing wrong and Holmes is merely trying to get back at him for the reprimand. That said, Holmes’s story sounds pretty plausible. More to come on this, I’m sure.